Richie Conn info coming soon! Spent 15 years with The Official Navy Jazz Band - Commodores. Currently with The Palm Beach Pops. Henry Mancini, Andy Williams, Johnny Mathis, The Four Freshman, Glenn Campbell, Steve & Eydie, Sammy Davis Jr., Robert Goulet, Mellisa Manchester, Ben Vereen, Doc Severinson and countless others! "One of the top 'Sinatra-Style' vocalists in the country today!" Bob has been influenced by many different vocalists over the years, among his favorites are Harry Connick Jr., Frank Sinatra, Al Jolson, Elton John and Billy Joel. Most people comment however on the uncanny natural likeness of Bob's voice to that of Sinatra's. So, with a full "kicking" and "swinging" 16-piece orchestra backing him up Bob takes full advantage of that fact! Mike has spent the last 15-20 years performing with the legendary Woody Herman Orchestra! Besides his duties on Baritone Sax, Mike is also their Personnel Director and Road Manager. He is also currently with The Palm Beach Pops. Jim was born in Flatrock, MI. and studied music at Miami Dade Community College. He has played with Frank Sinatra Jr., Glen Campbell, Jim Nabors, Chuck Mangione, Manhatten Transfer, Frankie Valli and the Four Seasons, The Temptations, The Four Tops, Robert Goulet, Jack Jones, Jerry Vale, Barry Manilow, The Four Freshman, Bernadette Peters, The Stan Kenton Reunion Band, Les Elgart, Larry Elgart, Ray Anthony, and Erskine Hawkins. Drummer, Frank Derrick, has led a multifaceted national and international music career. He is a virtuoso performer, composer, and educator. His many theatrical credits include Bubbling Brown Sugar, The Wiz, Ain't Misbehavin', Sophisticated Ladies, Big River, and Catskills. He has performed with Redd Foxx, Stephanie Mills, Della Reese, Freda Payne, Eubie Blake, The Platters, Eartha Kitt, The Duke Ellington Orchestra, Dorothy Donegan, Ken Peplowski, Dakota Staton, Steve Allen, Carol Sloane, Donna Summer, Keely Smith, Maureen McGovern, Benny Carter, and has conducted on the concert stage for John Pizzarelli and Lanie Kazan. He toured worldwide with Cab Calloway for ten years and was drummer for "The David Letterman Show" on NBC. In addition to the Bob Hoose Orchestra, he appears regularly with the Louis Armstrong Legacy Band, and is the principal drummer and assistant conductor for the Palm Beach Pops. Familiar to symphony audiences around the United States, Canada, and Europe, Frank Derrick has appeared with the Royal Philharmonic, the New York Pops, Pittsburgh Symphony, Calgary Philharmonic, and the Buffalo Philharmonic. His precision and driving rhythmic styling has been featured on the cast album of Bubbling Brown Sugar and "Cab Calloway Live from Freiburg Germany." His "Straight Ahead" composition garnered the A.S.C.A.P. Special Award. As an educator, he served as Director of Percussion at Henry Street Settlement in New York, presents master classes, is the respected auther of FOCUS ON TECHNIQUE For Drummers, (published by Hal Leonard) and a contributing author to various educational publications. Jim currently performs with and is also the Librarian for the Palm Beach Pops. Currently with The Palm Beach Pops. Tom has also performed with these other top acts: Aretha Franklin, Lional Hampton, Sammy Davis Jr., Vic Damone, Mel Torme, K.C. & The Sunshine Band, The Four Tops, The Temptations, Englebert Humperdink, Kenny Rogers, Patti Page & Rosemary Clooney. 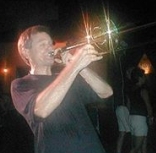 John is a native Floridian and has been an active freelance musician in south Florida for the past 25 years. He performs on tenor trombone, bass trombone and tuba. He is also a graduate of the University of Miami School of Music. During his career he has performed for such stars as: Luciano Pavaroti, Placido Domingo, Sarah Brightman, Frank Sinatra, Frank Sinatra Jr., Tony Bennett, Jerry Lewis, Jack Jones, Debbie Reynolds, Robert Goulet, Ben Vareen, Joey Bishop, Donald O’Conner, Danny Thomas, Vic Damone, Lou Rawls, Jerry Vale, Tony Martin, Linda Ronstadt, Pia Zadora, Natalie Cole, Paul Anka, Roy Clark, Maynard Ferguson, Kenny Rogers, Chuck Mangione, Larry Elgart, Willie Chirino, Juan Gabriel, Nelson Ned, Arturo Sandoval, Jose Luis Rodriguez, Mana, The Platters, The Spinners, The O’Jays, The Four Tops, The Moody Blues, The Fifth Dimension, and The Smothers Brothers. He has recorded for such stars as: Maynard Ferguson, Arturo Sandoval, Gloria Estefan, Ricky Martin, Jon Sacada, The Bee Gees, Nestor Torres, Jose Luis Rodriguez, Mana, Steven Stills, Celia Cruz, Robert Blades, and Willie Chirino. He has performed for such Broadway Shows as: Phantom of the Opera, Miss Saigon, Beauty and the Beast, Chicago, Fiddler on the Roof, Cinderella, Peter Pan, The King and I, Showboat, Nunsense, Anything Goes, Copa Cabana, A Chorus Line, Fosse, and South Pacific. DAVID HAMMER info coming soon! From Tampa FL, graduated from the University of Miami with a Music Engineering Degree. Performed in "Grease" starring Sally Fields; "Peter Pan" starring Cathy Rigby; "Damn Yankees" starring Jerry Lewis; and "Camelot" starring Richard Harris. Other "Concert" performances include Don Rickles and Cab Calloway. Frank Sinatra, Seals & Crofts, Stan Getz, Woody Herman Orchestra, The Palm Beach Pops.